Technology is becoming more and more advanced each day and signage technology is an aspect that is growing as well. LED signs are a hallmark of this merging of technology and signage. LED signs are signs comprised of light emitting diodes (LED’s) that shine bright and allow you to draw customers in to your place of business. These bright lights allow your messages to be seen at night and during the day with ease. LED signs are programmable from a computer allowing different messages to be shown whenever needed. This growing tech allows you to connect more with your target audience and reach a wider public. LED signs come in many different resolution and styles. 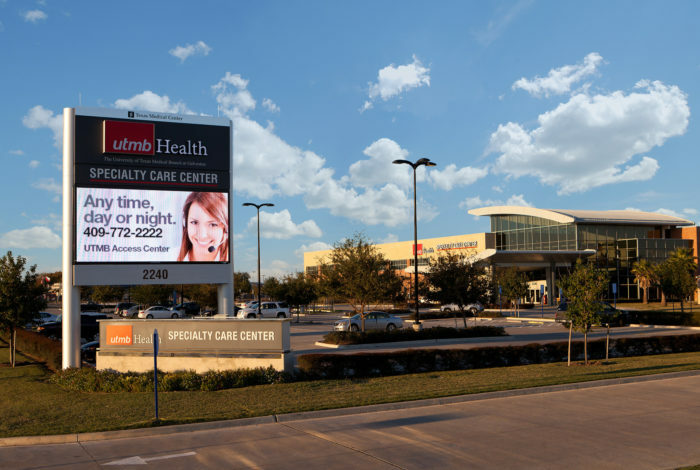 UTMB Health decided to go with a high resolution sign to attract their perspective audience. The high resolution allows for more of the LEDs to be more clustered together creating a tighter picture. The high resolution specification allowed them to add a quality picture alongside text content like a promotional offer, website, or phone number. These types of signs help attract your audience whether it be day or night. Standard resolution LED signs are an alternative type messaging center that can be slightly more simple, yet much more cost effective, yet will still allow you to communicate your marketing and promotional messages. Baton Rouge Dental Center chose a simple standard resolution sign to promote their location’s telephone number to prospective clients. These standard resolution LED signs may have a lower resolution but they will still be able to promote your message from a distance and be a dramatic additional point of contact with your audience. LED signs are a great way to promote your business and attract your audience 24 hours a day. If you think this type of sign would be a good fit for your portfolio of stores, clinics, or offices or if you have questions about your sign program in general, please contact us to start a conversation. Our team of sign management experts are eager to talk to you about why your company needs a single sign management vendor.